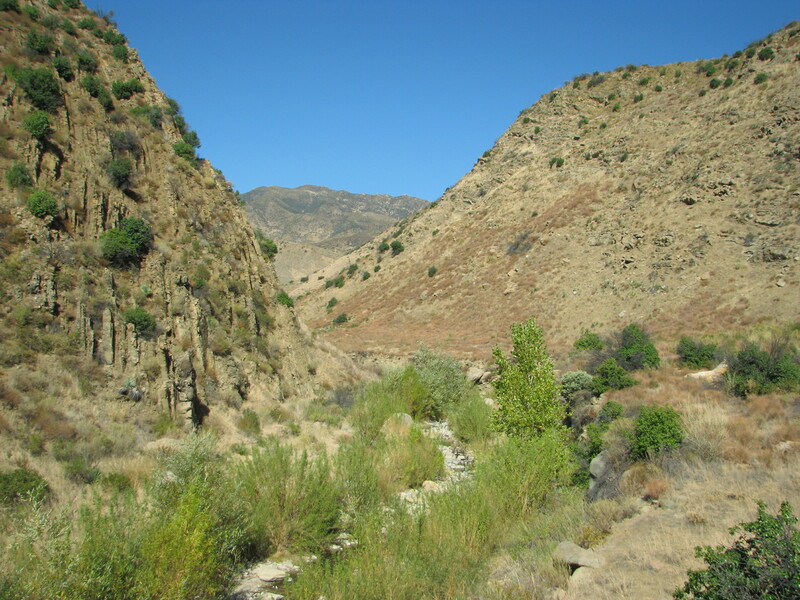 One of the nicer hikes in our area can be found along the Caliente Trail just past Agua Caliente Hot Springs. And while the hot springs themselves see many visitors few people venture any further up the canyon. The hot springs are located in the backcountry behind Santa Barbara and in the fall the colors of the canyon can be quite spectacular. The trail for the first few miles is fairly easy to follow and as an added bonus you can top off the hike with a soak in the hot springs. The hike to Upper Caliente Camp along the Caliente Trail is about 5 miles round trip, and the canyon as well as remnants of the old trail continue further still for additional exploring. To get to the the trailhead find your way to Gibraltar Road in the foothills behind Santa Barbara and follow it to East Camino Cielo Road. At East Camino Cielo turn right and continue along the top of the Santa Ynez Mountains. Along the way you’ll enjoy views of both the coast and on a clear day the Channel Islands on one side, and the San Rafael Mountains on the other. At Romero Saddle East Camino Cielo transitions into the Romero-Camuesa Road and begins its journey down the backside of the mountains towards the Santa Ynez River. There is no sign at the this transition, but from this point on the road is no longer paved, and while one does not need a 4-wheel drive vehicle it is a long and at times bumpy road. Because the forest service often closes this road at the turnoff for the Divide Peak OHV road when it rains, it’s best to check with them first to see if it’s open. Eventually the Romero-Camuesa Road crosses the Santa Ynez River near Juncal Dam and then slowly starts to level out until you arrive at a signed intersection. Here, near Pendola Station, you’ll want to turn right onto what’s called Big Caliente Road as it makes it way up Agua Caliente Canyon. Big Caliente Road dead ends at the Agua Caliente or Big Caliente Hot Springs and so these are also the same directions for the hot springs. Total drive time from Santa Barbara is about an hour and a half. There is no camping allowed right at the hot springs, however on the drive in you’ll pass Rock Campground along Big Caliente Road which has two campsites. And if you double back to the intersection at Pendola Station and turn right onto the Romero-Camuesa Road it crosses Agua Caliente Creek and almost immediately on your left you’ll see the turn off for Middle Santa Ynez Campground. Middle Santa Ynez is large site situated under the oak trees along the Santa Ynez River and has 9 campsites to choose from. 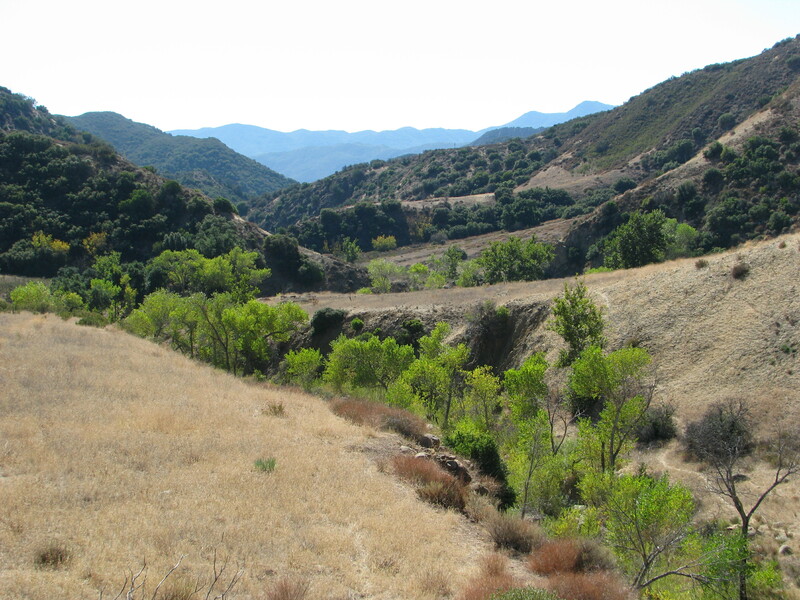 An adventure pass is required to park or camp within the Los Padres National Forest. 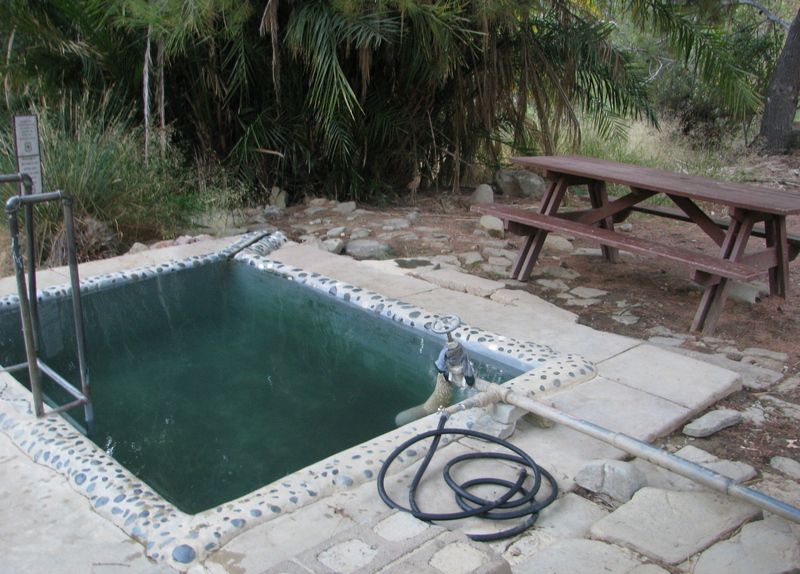 At the hot springs you’ll find a large pool right by the parking area that has recently been renovated by volunteers, from here continue up the canyon to where the trail begins. The sign at the trailhead lays out the scope of the trail, which at one time went all the way past La Carpa Potrero and connected up with Potrero Seco Road. The trail however is not maintained much past Upper Caliente Camp. Just past this sign you may notices several sides trails down to the creek. These lead to the two smaller pools which are the hotter compliment to the main pool found at the parking area. From here the trail continues upstream towards Agua Caliente Dam. 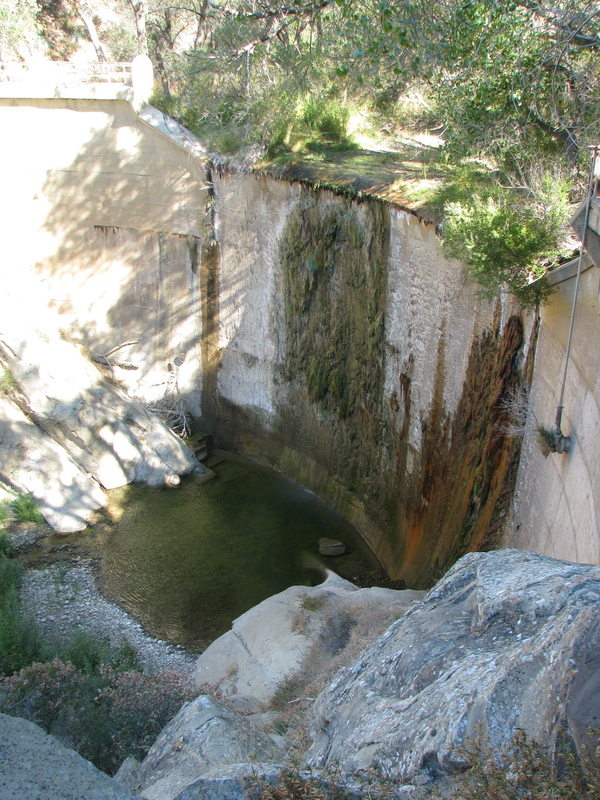 The dam was built back in the 1930s and the basin behind the dam is now completely filled with silt. Such basins are ideal for Cottonwood trees. At about the half mile mark the trail arrives at the dam which at one time had a great swim hole at its base before being filled in with silt from the 2007 Zaca Fire. From here the trail continues past the dam and through the Cottonwoods. Over the years the trail through this area has improved, however if you do get turnaround it’s helpful to remember that you’re traversing a small basin and that eventually the edge of the basin on your right, the trail and the creek all converge at which point the trail can be re-found. There is still water along some stretches of the trail but it starts to become intermittent the further up the canyon one travels. At about the one mile mark the trail transitions out of the Cottonwoods and the canyon begins to open up, offering views of golden meadows and grassy hillsides dotted with chaparral. The canyon continues to provide such views all the way to Upper Caliente Camp and beyond with each new turn in the canyon offering another great view. From this first transition you’ll want to start counting creek crossings, so that when you come to the third crossing you’ll recognize it. 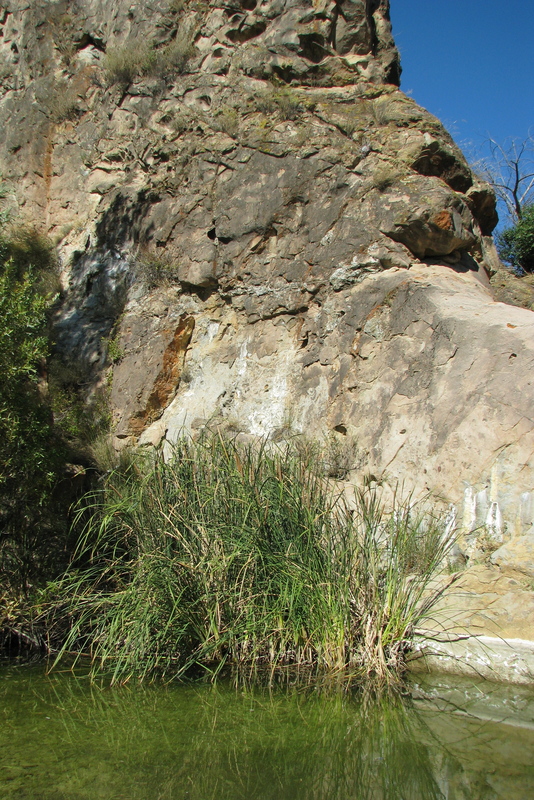 Just below Upper Caliente Camp is a rock formation that crosses the creek and creates a natural pool. At this third crossing you may notice a side trail that continues along the creek which leads to the pool. And although the pool is much smaller now with silt from the Zaca Fire it’s still worth visiting. The Caliente Trail continues above the creek, past the rock formation and then drops down into the natural basin created by the rock formation. From the trail you can make out the remnants of Upper Caliente Camp across the creek. The camp was burned in the Zaca Fire and in fact represents a transition point as everything upstream past the camp was burned in the fire while everything downstream was spared. The benches at the camp have been restored by volunteers, but the metal legs from the picnic table still remain as a stark reminder of the fire’s damage. From here one can continue exploring the canyon upstream. The trail continues and although it is overgrown, mostly with Star Thistle, and becomes indistinct it is still relatively easy to find a route. And there are enough remnants of the trail along the way to find a sense of encouragement. From Upper Caliente Camp the canyon leads through several more turns each with impressive views and the water improves the further upstream you travel. At about the 4 mile mark you’ll reach an improvised campsite which can make for a good return point. Here what’s left of the trail begins to climb out of the canyon and continues towards La Carpa Potrero. Regardless of how far you go you will get to see some incredible scenery and even have a chance to enjoy one of the few hot springs found in Santa Barbara County. This article originally appeared in section A of the Sunday, November 13th, 2011 edition of the Santa Barbara News-Press. I subscribe to the _Santa Barbara News-Press_, but not everyone does. Would it be possible to put the text of the articles on this website so that hikers could read what you’re writing without going to the _News-Press website_? and 2. the names of the relevant 7.5 minute topos. Thanks. Matthew, thanks for the suggestions. Older article actually do appear on the blog, just scroll down to view them or you can use the search feature in the upper right area of the blog or select from the categories below that to get at specific hikes. I like the map idea and wish I had a good uncopyrighted resource for them. I can look at adding the topo info and maybe some other basic logistical information.